Millions of search queries are made each second on Google. I might not be wrong, I will say that Google is a giant search engine. Around 80% people prefer it as their primary choice and it is most loved and even most used search engine. Google is smart enough to read your mind and can answer any questions. So what it actually do? Google is simply a medium between us (those who search) and the informative webpages. It indexes all website directory and add them in search results pages (also know as SERP) for a particular keywords. Results are arranged on the basis of post quality, keywords or other SEO techniques. The only thing user need to do is to type the words in Google search box and it automatically filter the best results for it. There is another hidden way to search on Google. This can be done with the help of search operators. They are used to find more accurate results. I had already posted an article on how to use Google search in advanced way where I clearly explain about this topic. You can read that post first. In the same way, these search operators (along with punctuation and symbols) can be used to crawl website data. Now let me ask you one simple question. What will you do to find out the complete directory of your favorite website? Most of the websites have user sitemap but unfortunately, they can't be used to search keywords. You have to go through each single link so as to find the exact webpage you're looking for. Also, It would be a time-consuming task to search the whole website from one webpage to another. All these things can be easily possible with search operators. Google is very fast to load so this will also improve your user experience and you can easily navigate to any webpage. 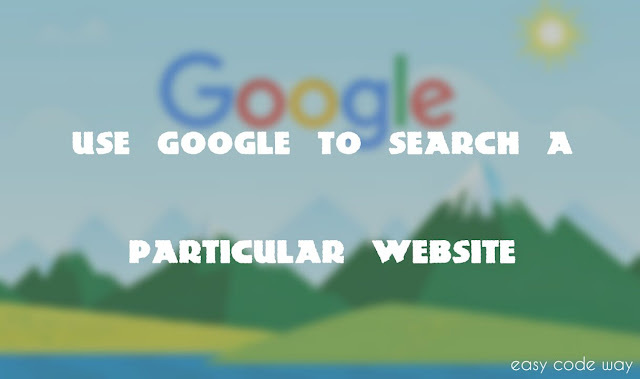 On the other hand, these search operators can also be used by web developers or bloggers so as to understand how Google is indexing their website. Below is the detailed information about this topic. site:.com - This will list all .com domains. site:www.wikihow.com Hello World - This will filter out all wikiHow webpages that have "Hello" and "World" words. You can replace them with your own keywords to find the exact thing you're looking for. Note: This operator will work only for those websites which Google have access to crawl. This access was given by website admin via Google Webmaster Tool by verifying their property. If you've a new website and trying to use this site operator on it then, it may display 0 results. You can troubleshoot this problem by adding your website in Google Webmaster Tool. Now let me tell you about the basic logic behind this process. Whenever a new webpage is added on a website, it will add that link to sitemap which was later crawled by Google Bots (also know as spiders). As it will detect new updates, search result pages will be updated simultaneously. Admin can also block the access of Google bots or tell them what to index or not. This can be done with the help of robots.txt file or by using meta tags. These things are beyond the scope of this tutorial. 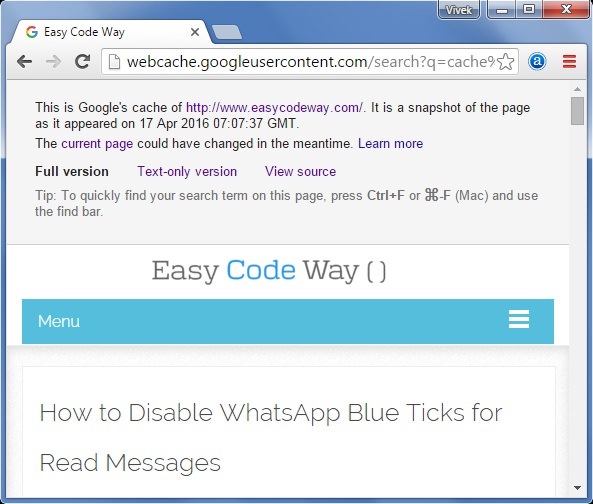 For example, "cache:www.easycodeway.com". You can also find the time information when Google crawled the website last time. This data is useful for bloggers and web-developers to find the crawl rate for their website. Another amazing thing about cache operator is that, you can view the source code of cached webpage or use it in text-only version. Note: As Google will crawl the website next time, new changes may appear. It doesn't keeps record of old data. Info is another useful operator which let you know about basic website information. The syntax for this operator is similar to others. Simply replace "site" with "info". 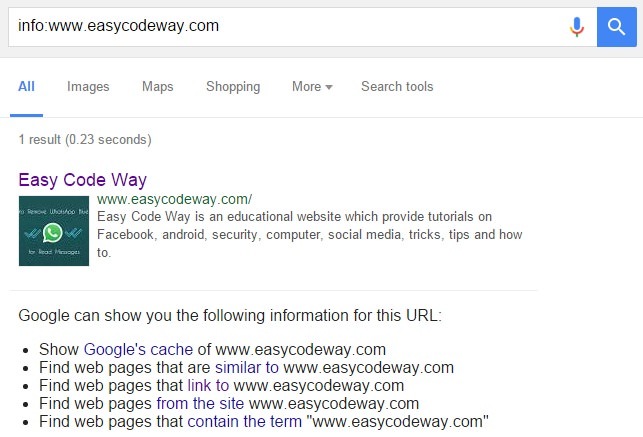 For example, "info:www.easycodeway.com"
Webpages that are linked to it. All indexed webpages of site. Webpages that contain the term you've searched. Before moving to the next operators, first learn about asterisk and quotation marks. Actually they aren't search operators but In English language, we call them punctuation mark. On the other hand, they are also used as wildcard. Below is the explanation on how to use them while Google searching. How to create * program in * site:wikihow.com - This can replace * with any word or phrase. For example, it may result into "How to create hello world program in c++" or "How to create c++ program in code block". I had also used site operator so that it will narrow down the search results to a particular site only. How to upload video on * - Here asterisk can be replaced by Facebook, Twitter, YouTube or any other word. Quotation marks - Quotation marks ( represented by - "") are used to find the exact pair of words or phrase. Learn its use from these examples. "How to deactivate Facebook account" - This will show results which have the exact pair of words as stated under quotation marks. These can be found in title, description or in between article. 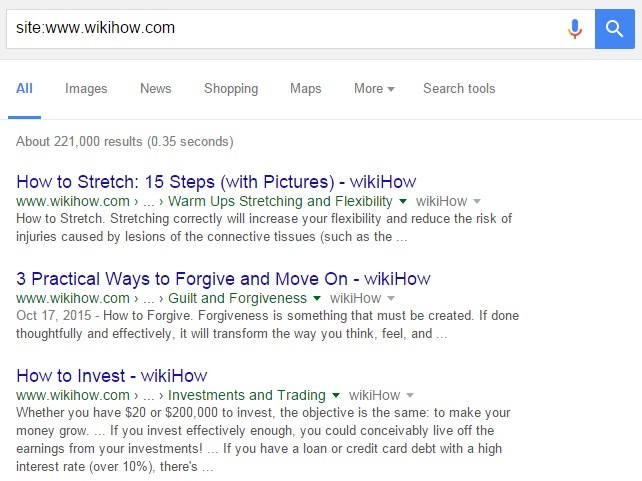 site:www.wikihow.com "How to make *" - You can also combine these asterisk and quotation marks along with site search operators. Note: Use quotation marks only when you're sure about results. They may skip some of the useful results by mistake. allintext - This is used to find the text in between webpage. For example, allintext:"How to create Facebook account"
allintitle - Each webpage has its own title tag which appear as a healing in search result pages. This operator can be used to find text in webpage title. For example, allintitle:"How to" will result all webpages having "How to" in their title. allinurl - In the same way, each webpage has it own unique web address. You can use allinurl operator to find the text in web URL. allinanchor - This is another advanced operator which is used to find the anchor texts. Basically anchor is a HTML tag which is used to add links in a webpage. For example, allinanchor:"Facebook" will result all webpages that have "Facebook" in their anchor text. Try more complicated combinations yourself. Below is the explanation to few more common Google search operators which can be useful while crawling any website. Tilde (~) - Adding a tilde before any word will result into its synonyms. For example, If you'll search for "~create", It may show results having "make", "design", "build" or other similar words. Negative (-) and Positive (+) Sign - Adding a negative sign before any word will remove that word from results. This can be helpful when same word have two different meanings. For example, Apple can be a food or iPhone. Now for instance, If you want to search for Apple as a food, you can type "Apple -iPhone". This will remove all iPhone results. Additional, if you want to target specific keywords, use plus sign. For example, "Apple +tree" will show all results about apple tree. Related Operator - This is another Google search operator which let you find related domains. For example, "related:www.google.com" will show all domain related to Google. Guess what it would be? Very simple. It will show other search engines similar to Google like Yahoo or Bing. This operator may not work for some websites. Note: While using these search operators and punctuation, make sure to remove all space between operator and search term. For example, "site:www.google.com" will work fine but "site: www.google.com" willn't show any results. You can crawl any website with just few operators as explained above. It may be hard for you to remember their syntax and use. To make your search more simple, Google provide advanced search tool. This will automatically add operators and punctuation to your search. Simply open this tool and add the words that you're searching for. Then narrow your results by choosing language, region, last update and site domain. Also target the location where you want to find these keywords by choosing "Terms appearing" option. Additionally, you can select the file type and usage rights options. When everything is done, click "Advanced Search" button and see the magic. Note: In this tutorial, we are searching a particular website. So don't forget to add your website address in "site or domain" option. In this way, you can use Google to search a specific website. All what you need to know is the proper use of search operators, punctuation mark and symbols. Finally, If you've any questions, feel free to ask me in below comment box. Stay tuned for more interesting updates.